What we have is the economics of genocide; it has now become a mutually assisted Suicide Pact. "I do think your description of C&C as a 'well tempered' carbon budget approach, is brilliantly insightful." Of all the comments made (mostly, but not always, favourable) over the now 30 years about the C&C campaign, this remark is really one of the most rewarding. It was made recently by a long term ally, friend and 'climate-expert' who stands out for actually deserving that description. to integrate the full-term international process of UNFCCC-Compliance. This requires the arrest of atmospheric GHG accumulation curving upwards so it gradually curves downwards to a level pre-judged as 'safe & stable' (e.g. at least 350 ppmv). which countervails the coherent goal-focused process needed for compliance in a structure defined by the deliberate commutation of the parts with the whole. Comment: - continuing to do too little too late with emissions control simply deepens the non-compliance that results from non-commutation, as precaution & prevention continue to be subordinated to structureless 'growth differentials' in the arbitrage economics of beggar-thy-neighbour. Eventually, due to non-compliance as the velocity/volume of climate damages exceeds those of this 'economic growth', the anthropocenic system as a whole collapses. 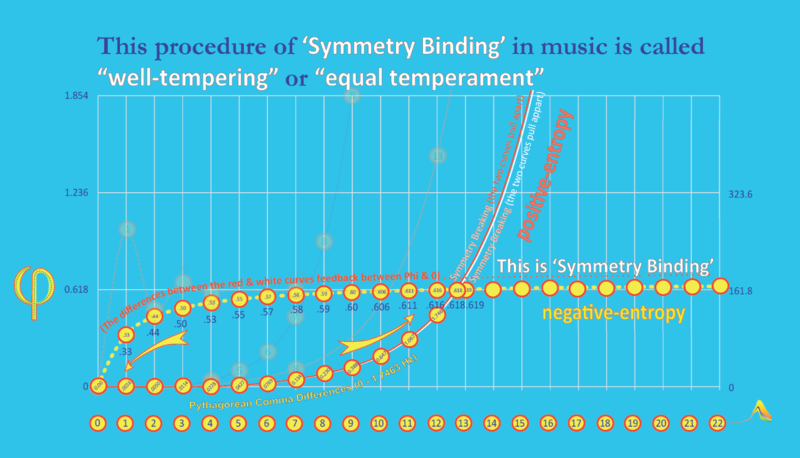 Equal Temperament or 'Well Tempered Tuning', comes from resolving the 'Pythagorean Comma'. In essence it means tuning the 12 semi-tones equally within the fundamental doubling structure of the musical 'octave'. Introduced around 1720, the classic example is J S Bach's 'Well Tempered Clavichord'. 'Well Tempering' assumes 12 equal semi-tone steps within the Perfect Octave (a doubling). It is the definitive expression of equal temperament. equal temperament enables music to be written in, tuned in, played in and to modulate between, all 12 musical keys within the Octave (doubling). this 'well tempering' simply means that all combinations in all keys always commute as equally 'in-tune' and 'in-time' within the Octave (doubling). assumes equal per capita or 'Well Tempered' emissions rights globally, with a base-year for future population sizes, as this . . .
enables any rates/weights/dates of a C&C carbon budget to be calculated and shared, so the total always commutes with its 'well tempered' parts and . . .
the process of carbon-contraction as a whole can be precisely aimed from the outset at a UNFCCC-Compliant outcome for atmospheric GHG concentration. GCI intentionally nick-named C&C, 'The Well Tempered Climate Accord' to underline the non-ideological properties of this methodology. The CBAT animation enclosing C&C was created to change the mind-set from 'evolution' to goal-focused 'evolition' with respect to pursuing UNFCCC-Compliance. CBAT has 1,000,000 possible rates of C&C that always commute as convergence is always subordinate to contraction. The C&C 'event', like an 'Amen' cadence in music, embodies the functionality of a goal-focused structure. 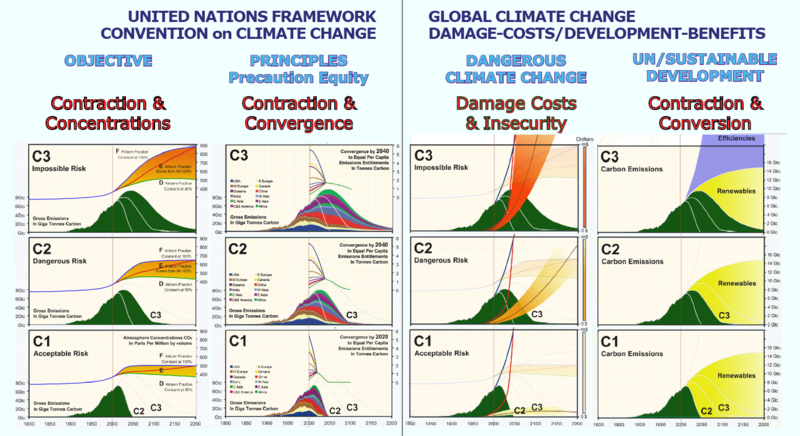 For 30 years, 'ideological assumptions' have obscured the sine-qua-non for UNFCCC-Compliance, a non-random internationally inclusive path-integral for a limited & declining future weight of emissions internationally shared on a precautionary and preventive basis i.e. completing a full-term 'C&C-event' as quickly as possible. In 2008 Professor Ross Garnaut advanced a significant but residually ideological statement about C&C saying, "(it) has the virtue of simplicity. Equal per capita emissions is a natural focal point. Contestable computations based on economic variables do not need to enter the allocation formula." Recognizing economic variables as 'contestable' was certainly an improvement on the earlier 'ideological charge' laid by John Ashton of the UK Foreign and Commonwealth Office (FCO) who stated in 2002 that, "C&C is compelling, yet at its heart lurks a contestable ideological assumption; equal per capita emissions as rights". When the logic is understood, there is nothing 'ideologically contestable' about 'C&C' at all. It is ideology per se that is 'contestable' as it is 'motivated'. The 'logic' is 'mechanical'. Particles & waves cohere and/or decohere as feedback integrated between ratios-rates and rational-irrational numbers. Earlier still in 1998, British sociologist Professor Anthony Giddens claimed that the radical center is synonymous with the Third Way. For Giddens, an advisor to former British Prime Minister Tony Blair, and for many other European political actors, the Third Way is a reconstituted form of the ideological amalgam know as 'social democracy'. 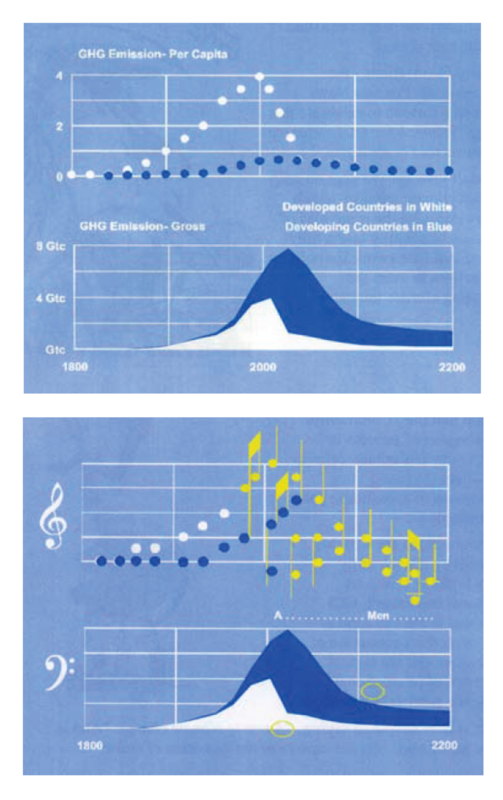 In the IPCC Second Assessment in 1994, UK and US economists introduced Global-Cost/Benefit-Analysis (G-C/B-A). As all the 'costs' of Global Warming had to be included in this tally,the cost of the 'mortality' due to climate change had to included. This in turn required that these deaths had to be estimated, totalled and converted to a 'cash-value'. 'Contingent markets' were created for this valuation. This turned out to mean that the climate-change-related death of a person was proportional to the income of that person while alive. This in turn resulted in the infamous 'average' where the cash value of fifteen dead Chinese people equalled one dead English person. Inevitably, there was a huge row about this. The difficulty was that economists demonstrated it was cheaper to kill people than solve the problem. Consequently GCI argued that the 'logic' of this ideology was the 'economics of genocide', whereas solving the problem, meant choosing the C&C framework over guesswork and that this was and still is the non-ideological choice. Incensed at the row generated by his 'harmless' technique, Professor David Pearce called the campaign against it, "the stupidest campaign in history". 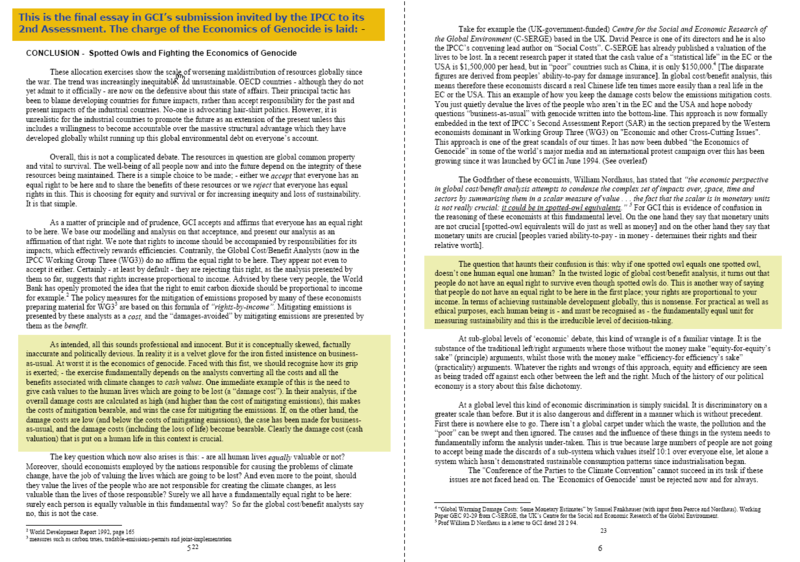 Professor William Nordhaus wrote an angry letter to GCI saying, "if you don't like it being done in $s, you can have it in spotted-owl-equivalents." A sharp response to David Pearce was sent by UK Ambassador Sir Crispin Tickell, "I beseech you in the bowels of Christ, think it possible you may be mistaken." The response to Nordhaus was simply to ask, "why, if a spotted owl equals a spotted owl, doesn't a human equal a human?" This argument has run and run. The Guts of it - it is ideological NOT to make the 'non-ideological' 'Well Tempered' assumption. This is the guts of it - all of the above recognized as the granularity and 'diplomacy' of 'real-politik' - GCI has nonetheless argued from the outset that it is ideological not to make the 'non-ideological' 'well tempered' assumption. Since 1989, GCI has held this view until the present day. It underpins Plan B's court-case in the Royal Courts of Justice. Important as 'equal rights' per se are or may or may not be to some, unless we 'well temper' global emissions rights as 'equal', full-term modelling emissions control-rates globally makes UNFCCC-Compliance unachievable; 'contraction' simply remains the aspirational result of an array of conflicting second-order assumptions about convergence. Unless we choose a 'framework' based on making the well-tempered assumption, we remain stuck in a process of real-politik distorted by socio-economic 'guesswork'& ideological bias. Resolving this problem too slowly, while we are running out of ‘opportunity time’, is running into the growing ‘opportunity cost’ of not really resolving it at all. This is the origin of turning away from the roulette of a 'Market-based Framework', back to a non-random 'Framework-based Market' of C&C or the 'Well Tempered Climate Accord'. Resolving the fundamental quarrel, resolves issues arising as we strive jointly & severally to achieve the Compliance we've known ab initio that we must achieve to survive. An obvious truth consistently ignored. As the last 30 years have demonstrated, use of this roulette-model has been progressively decreasing the odds of UNFCCC-Compliance, while increasing the odds of the 'looming climate catastrophe for mankind' alluded to by Sir David King at the IEA in January 2016. Consequently, as we accelerate out of control towards the event-horizon of global carbon consumption the other side of which is the irreversibility' of runaway rates of climate change, the strength of the well tempered proposal is increasingly evident. This is obviously the case when, as 'business-as-usual' time runs forward, the amount of carbon available for the contraction-event needed for UNFCCC-Compliance is shrinking,which means it must be revised downwards enough and soon enough to reflect this. While this has started to happen, we still remains stuck in the randomness of too-little too-late. The complete full-term expression of this (covering the period 1750-2050) was finished in 2015, in conjunction with Plan B. Plan B have now commenced a climate litigation campaign as argued for example in this evidence to the High Court.